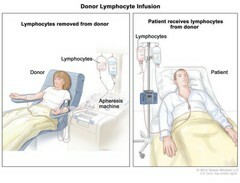 Donor lymphocyte infusion; (Panel 1): Drawing of lymphocytes being removed from a donor. Blood is taken from a vein in the donor's arm and flows through an apheresis machine that removes the lymphocytes. The blood is then returned to the donor through a vein in the other arm. (Panel 2): Drawing of lymphocytes being given to a patient through a catheter in the chest.